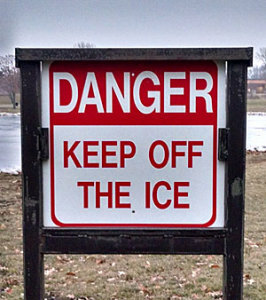 After the weekend deaths of three ice fishermen, state officials are warning all ice anglers to be extremely careful as they venture onto frozen ponds and lakes, especially with very warm weather in the forecast. Kevin Baskins, spokesman for the Iowa Department of Natural Resources, says there’s no such thing as “safe ice” even during the middle of winter, but conditions are more risky now with spring arriving next week. Some bodies of water may be fed by springs or pipes that pump in water and keep the ice very thin and fragile. Ice fishing season is not officially over, even though the high temperatures this week are forecast to reach into the 50s and 60s. Baskins says, “Certainly, as you get to the far north, there is still some fairly thick ice that’s still available as you get up into some of those northern natural lakes.” Anyone venturing onto the ice needs to watch out for thin, clear or honeycombed ice, while dark snow and dark ice are other signs of weak spots. Divers recovered the bodies of all three missing fishermen from a farm pond in Union County on Saturday. All three were from Creston and they’re identified as: 71-year-old Earl Burkhalter, 73-year-old Charles Critz and 68-year-old James Oshel. Officials say it’s possible a tile line caused water to run into the pond, creating very thin ice.